Lock in a great price for Holiday Inn Express Hotel & Suites Rogers – rated 8.9 by recent guests! Breakfast was good. Location was excellent. Staff was very friendly and helpful. Friendliness and helped with information of the area. The room was comfortable and clean. The breakfast was delicious and the location was perfect for visitors. Breakfast variety was nice for kids. The pool temperate was good. Pool area was clean. Breakfast selection was good. Beds were firm but comfy. Lots of pillows on the bed= happy mama. WiFi worked great for streaming a movie after the kids went to bed. Staff was polite and courteous at all interactions. You had q tip and make up wipes in the bathroom that's awesome. Because we forgot ours at home. Amazing rim great staff. I liked the location and the breakfast was great. The pool was awesome! Our 2.5 and almost 5 year old LOVED the pool and splash pad/kiddie pool area! We honestly could have swam all day! :) Staff was super friendly, and hotel was modern and clean looking. Very clean. staff was extra helpful. Free breakfast was wonderful. Holiday Inn Express Hotel & Suites Rogers This rating is a reflection of how the property compares to the industry standard when it comes to price, facilities and services available. It's based on a self-evaluation by the property. Use this rating to help choose your stay! Offering free Wi-Fi and a flat-screen TV in every guest room, this Rogers hotel is less than 10 minutes’ drive from Fox Hollow Golf Club. A complimentary continental breakfast is served each morning. Tea and coffee-making facilities, a microwave and a small refrigerator are included in each guest room at Holiday Inn Express Hotel & Suites Rogers. A hairdryer and an alarm clock are also provided in all rooms. Guests can enjoy a workout in the fitness center or swim in the indoor pool at Rogers Holiday Inn Express Hotel & Suites. A business center is also available on site. Minneapolis is less than 26 miles from this hotel. Daytona Golf Club and Diamond Lake are 10 minutes’ drive away. This property also has one of the top-rated locations in Rogers! Guests are happier about it compared to other properties in the area. This property is also rated for the best value in Rogers! Guests are getting more for their money when compared to other properties in this city. 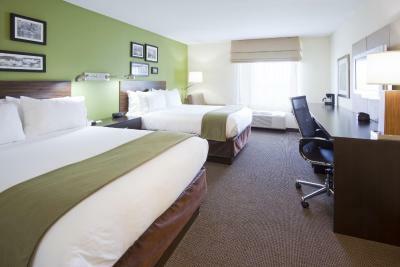 When would you like to stay at Holiday Inn Express Hotel & Suites Rogers? This suite has a flat-screen TV, air conditioning and microwave. House Rules Holiday Inn Express Hotel & Suites Rogers takes special requests – add in the next step! Holiday Inn Express Hotel &amp; Suites Rogers accepts these cards and reserves the right to temporarily hold an amount prior to arrival. Holiday Inn Express Hotel & Suites Rogers accepts these cards and reserves the right to temporarily hold an amount prior to arrival. Please be advised the pools and spa will be closed until April 2017. Contact the hotel for details. Room was clean and very comfortable, staff was friendly, breakfast was amazing! Lots of hot food choices (pancakes and cinnabons were the best). Fresh coffee or tea was always available. The kiddie slid was very hard my daughter hit her head it needs padding. The room I booked was not available. I even called the hotel directly before booking to ensure the King Executive had the separate seating area, which they assured me the room I was booking matched the picture. However, when we got there the room was small and did not have the separate area. We went back to the desk and they got us into a new room, but it was the same exact room as the first. We went back down to the desk and they had to give us a third room, which was closer to what I wax expecting but still did not look like the picture shown during booking but was better. However, the room was covered in dust - all the way across the top of the headboard, the lamps, the desk, etc. The hotel was nice and conveniently located. None at all....everything was perfect! Would definitely come back for sure. Breakfast was super delicious! Front desk were very accomodating and friendly. Kitchen staff were very helpful. All of them had a smile on their face. Room and bathroom were very clean.